Want to learn more about the maker movement in America - a new wave of Do-It-Yourself and Do-It-Together fueled by passion and powered by the advent of new technologies? Did you attend the We #MakeHealth Fest and wonder how volunteers like Aaron Brown with E-Nabling The Future, create affordable and custom 3-D printed prosthetics? 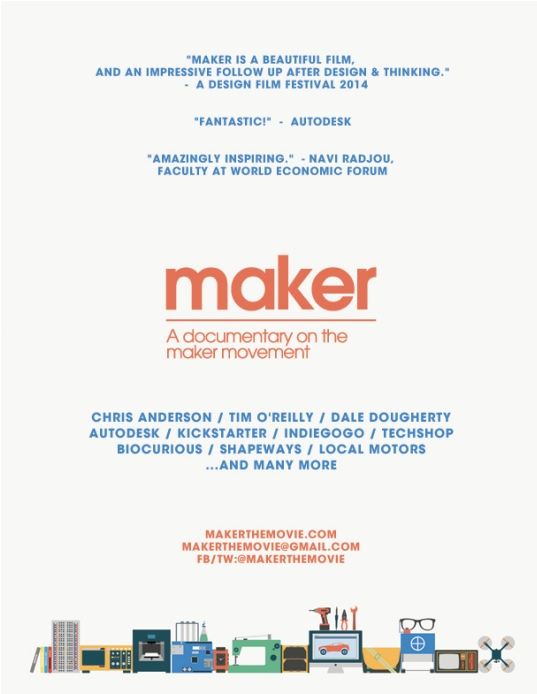 Please join us for a free and public screening of Maker, a documentary on the maker movement. It’ll offer a dose of inspiration for the #makehealth movement at the University of Michigan. Parking: Thayer St. Parking Structure is open to UM Blue and Gold pass holders only. There is also metered street parking. Public transportation is recommended. Directions: The easiest access to Ehrlicher Room (3100 North Quad) is through the plaza entry at Thayer and Washington streets. Come through the main doors on the right, then proceed to the elevator on your left inside the main lobby and proceed to the third floor. The Ehrlicher Room is immediately to the right of the elevator. RSVP: Seating is limited, so sign up below so we can count you in! We just put an application into the Provost to support our work. Please add your name to express your support for HealthDesignBy.Us either in public or in private! Older PostMeet your a2geeks board!